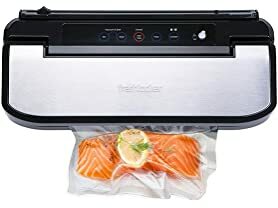 $34.99 Freshlocker VS160S Vacuum Sealer Automatic Food Saver - dealepic . This Freshlocker VS160S Vacuum Sealer Automatic Food Saver features a gentle mode for moist/juicy foods and normal for dry foods. Extra vacuum hole on the top of the machine for vacuuming canisters.